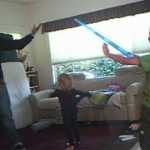 Currently viewing the tag: "family fencing"
One day in September, 2011. I think this speaks for itself. Or maybe I’ll comment later.